The Lagos Islands weekly teacher's training sessions have been emphasizing effective teaching skills to make each and every lesson filled to the brim with FUN and an experience which leaves you with a smile on your face. In the above picture, Samantha and Claudine are having great fun (to the amusement of Betty, Grace and Orji) pretending to be unruly children. Trainee teacher Orji showing the other teachers just how to express with your face, and good tambourine utilization. All training sessions are jam packed with new creative ideas, lots of sharing and interaction and above all, learning the skills to make each and every lesson FUN! 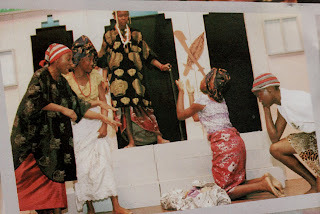 Tuesday the 25th of May 2010, was a memorable day for the students of Discovery House Montessori School in Lekki, as they joined students from other schools to watch a short play captioned THE REJECTED BLESSING at the National Theatre. It was an educational experience for the children as they learnt about theatre etiquette and had an opportunity to appreciate their culture via the dances and traditional attires which were show-cased. A long, long time in the future, in a galaxy yet to be discovered, Space Cruiser 5 is under attack from the Targons. But why? On board ship, there is unrest amongst the crew members. The robots, brought on board by the Captain, have gone wild. Is there a malfunction…or is it an act of sabotage? Parents and friends attending the parent’s day presentation at American International School Lagos Nigeria were in for a treat, as the lower and upper primary students thrilled the audience with a short presentation to the amazement of parents and friends alike. The lower primary did a short play titled THE CHICKEN HEARTED FOX. Everyone lives happily and works on Farmer and Mrs. Giles’ farm. Freddy and Frances Fox wait patiently until they settled down for the night to come and steal their chickens, as they are veeeerrrryyy hungry! Freddy Fox is not very brave, so will they get a good and hearty chicken meal, or will they get caught?